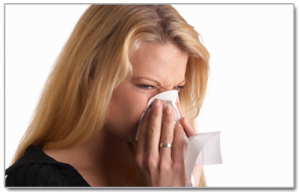 Millions of people who suffer from allergies have enjoyed the benefits chiropractic care provides. Although we cannot call chiropractic care a “cure” or “treatment” for allergy symptoms, we can tell you when the body is functioning at its best your immune system is capable of fighting off many of the symptoms caused by allergies. Many times we have seen chiropractic care strengthen the immune system to the point our patients no longer need allergy medication. So how can our chiropractic care help? First it is important to understand how and why allergens affect your body the way they do. Your immune system is designed to eliminate anything that is not supposed to be in your body; dust, pollen, foreign bacteria, pollutants, drugs, etc. By aligning your spine with chiropractic care, we can help strengthen your immune system and create a higher resistance for disease and infection. With our full treatment plans we can have you living a healthier life style by helping you with diet and exercise advice, nutritional plans, and chiropractic adjustments.